We strive to make MMM Custom Bike Show an exciting and rewarding experience for our guests. Please help us achieve that goal by completing our brief and confidential Online Survey. Your survey results will be combined with those of all other respondents and then tabulated, analyzed and utilized to structure the show so it's strategically, tactically and developmentally consistent with the needs and desires of Michigan's motorcycle community. It will take only a few minutes to complete the closed-ended survey questions. As a token of our appreciation, when you click submit you will receive a Gift Certificate that's redeemable for an exclusive gift at the MMM Custom Bike Show. Simply bring your Gift Certificate, and a picture ID, to the MMM booth at the show and redeem it for an exclusive gift. 1. Complete the brief and confidential Online Survey below and click Submit. 2. 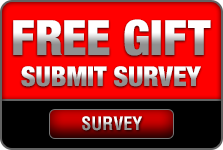 Click the Gift Certificate button on the Survey Confirmation page. 3. 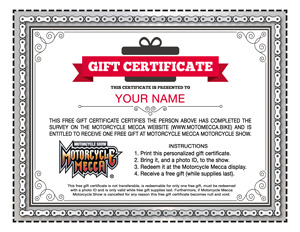 Print your personalized Free Gift Certificate and bring it, and a picture ID, to the MMM booth at MMM Custom Bike Show and redeem it for an exclusive gift. We will not market, transfer, or sell your Online Survey or contact information to third parties for any reason. Your survey results and contact information will only be used to conduct internal market research analysis and to validate your personalized Gift Certificate.